The T-70 was yet another stop-gap in Soviet tank production. Ther performance of Soviet light tanks of that time was abysmal, despite prolific production, whilst T-34 production suffered from problems. These tanks were horrendous owing to their poor maneuverability, weak guns, and inferior armor. The T-70 was an attempt by N.A. Astrov to counter these three problems. Whilst the gun was generally better suited to the reality of tank-on-tank warfare, it still had poor mobility and underwhelming protection. The tank’s legacy passed on into the somewhat well-known SU-76 self-propelled gun, which was also a less than desirable tank. A winterized T-70 is prepared by its crew. Late designs of the T-60 attempted to mount a new turret in order to handle a stronger gun. They redesigned the turret with flat armor and larger dimensions. They also placed it slightly off-set to the left, with the engines on the right for ease of production. 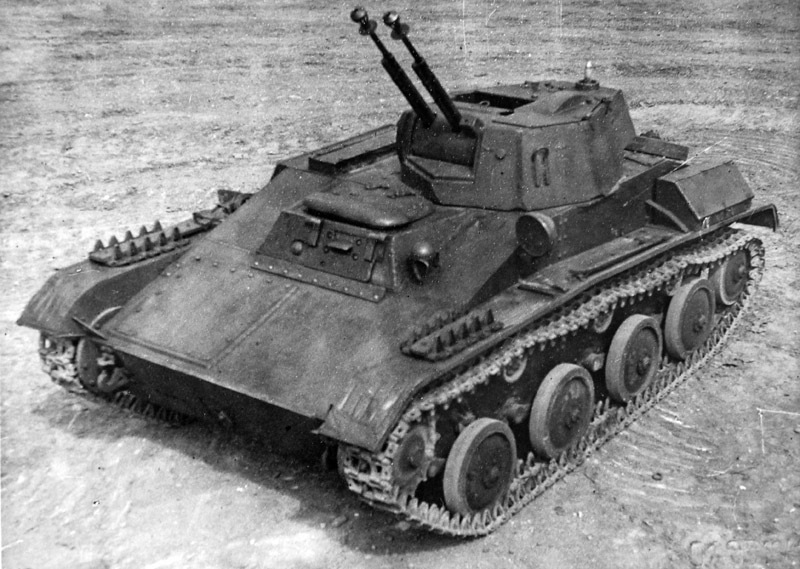 The T-70 was accepted for production right away in March 1942. However, despite attempts to create a modest improvement on the T-60, it was, in some ways, no better. 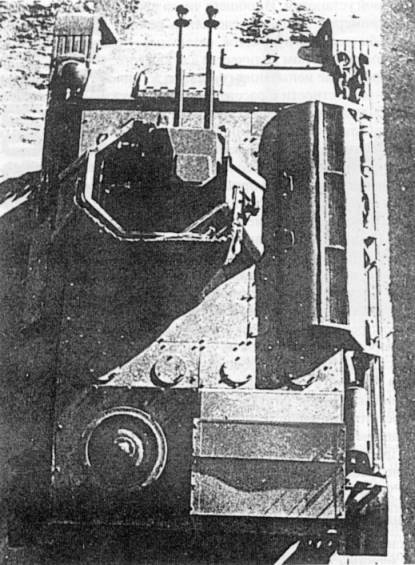 It may appear that mounting a new 45 mm (1.77 in) ZiS-19BM gun and giving the tank 45 mm (1.77 in) frontal hull armor increased protection and firepower. However, German modifications to the Panzer III and IV with regards to armor and guns negated all these advances that the T-70 came with. Also, the problems of having a two-man crew were still prevalent. Having a commander who also had to double up as the gunner meant that he was often over-stretched, especially if he had to direct the driver and fire very accurately. The restrictions of a two-man crew were seen in all Soviet light tanks with the exception of the T-26. The T-70’s major shortfall was its mobility. The chassis of the T-70 was a direct copy of the T-60 but modified to front-wheel drive instead of rear-wheel drive. Reliance on other existing technology cut development costs significantly and led to a rather unorthodox design using two GAZ-202 lorry engines (which were rated at 70 hp each), one for each track. However, this led to serious problems, such as the driver finding it difficult to control two engines. Late production T-70 models were fitted with two GAZ-203 85 hp engines. The T-70 barely achieved greater speeds than the T-60 and its cross-country range of 180 km (110 mi) was 70 km (40 mi) less than the T-60, and half of a T-34/76 M1943. The T-70 was even less suited to taking part in the fast-paced, Soviet deep battle doctrine. Production ended in 1943 when it was just deemed unsuitable. The most produced T-70 tank was actually called the T-70M. The original T-70 featured two GAZ-202 engines, one powering each track. As mentioned earlier, after this was found totally impractical and the practice was ended in very early production. The engines were instead mounted on the right-hand side of the vehicle, and a normal transmission was fitted. The original turret was also conical, but this was also replaced with a welded turret that was offset to the left of the hull. Conical turrets were replaced with welded turrets in April 1942. Despite technically being the T-70M, it was simply referred to as the T-70. The T-90 was an armored self-propelled anti-aircraft gun tank. It was designed because at the beginning of World War II as the USSR had none at all. 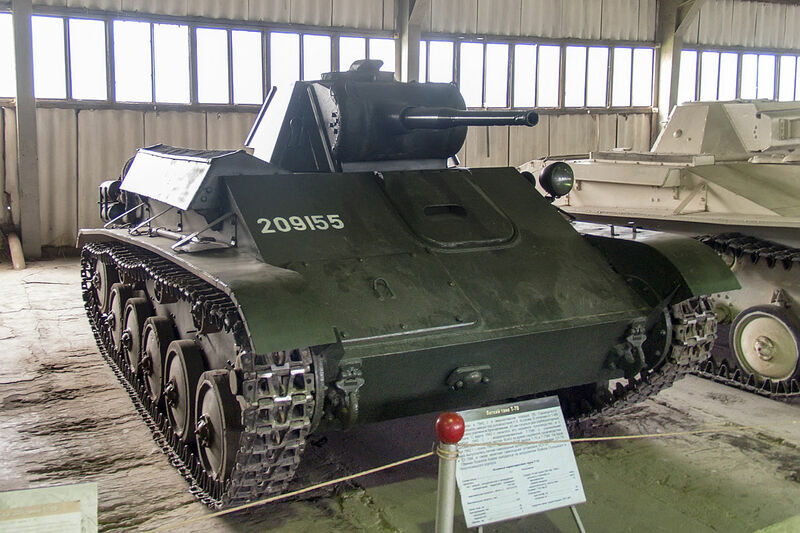 The first serious design of a real air-defense vehicle was in 1942, when a twin 12.7 mm DShK machine gun turret with optical sights was built for mounting on the T-60. The T-70 became available in the meantime, and was adopted as the basis for the T-90 self-propelled anti-aircraft gun. 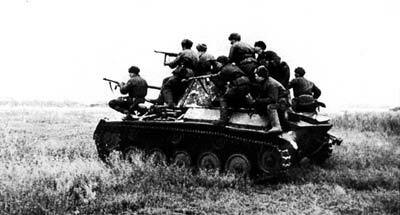 The program was canceled in 1943, in favor of the ZSU-37 self-propelled anti-aircraft gun, built on an SU-76 chassis. The SU-76 and SU-76M was a tank destroyer based on a widened T-70 hull (T-70 and T-70M respectively), and whilst it had better combat results than the T-70, it was hated by its crews due to its light armor and unreliability. 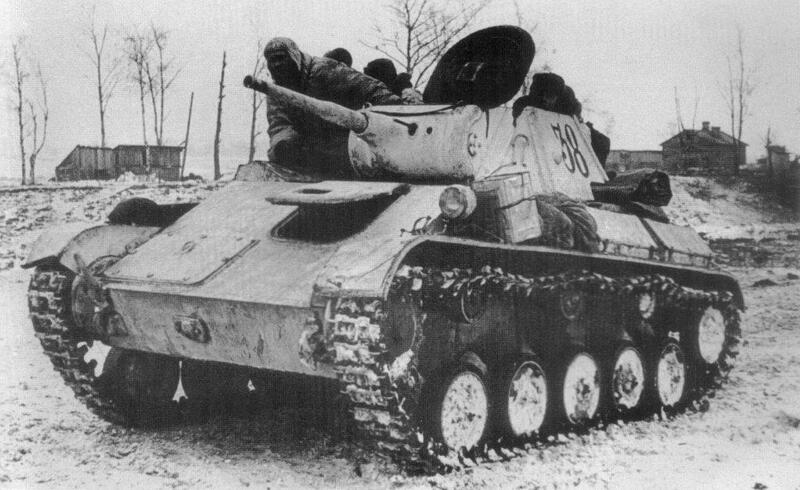 As with almost every Soviet tank, small but unknown numbers of captured T-70s were put into service with the Wehrmacht. A preserved T-70 at Kubinka Tank Museum. A T-70 in German service. 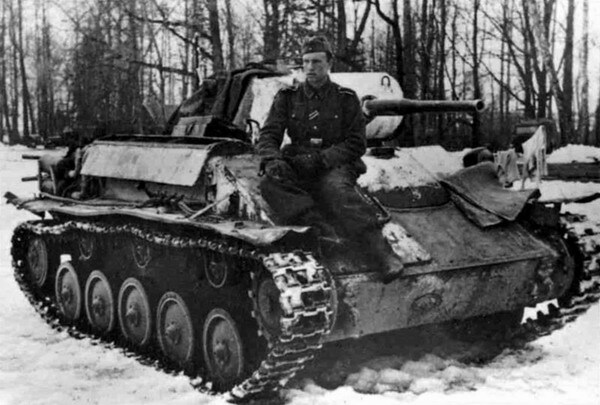 Wehrmacht use of captured tanks was very common. 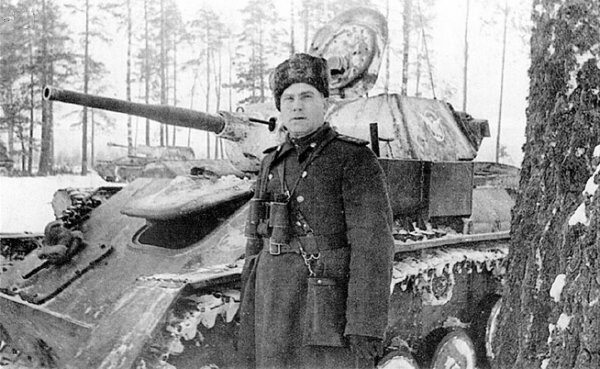 The best recorded performance of the T-70 took place on March 26, 1944 when Sergeant Alexander Pegov of the 3rd Guards tank army, commanding a single T-70, saw a column of approximately 18 German tanks approaching. He took an ambush position hidden by foliage and then he waited. 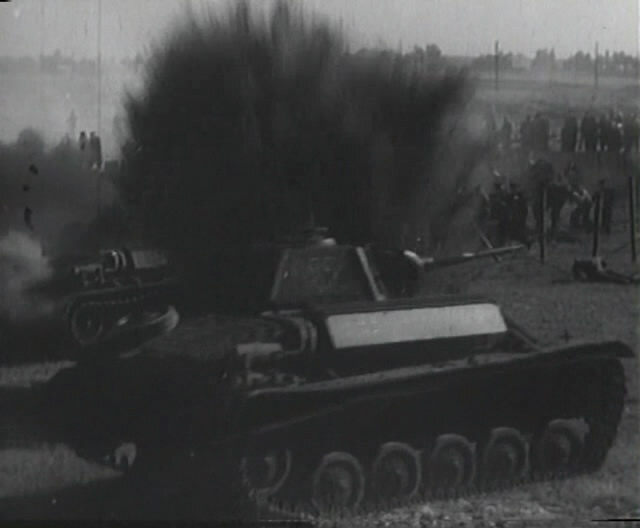 After a Panther tank came within 150 to 200 meters, the T-70 suddenly opened fire with APCR ammunition and set fire to one Panther and immobilized another. 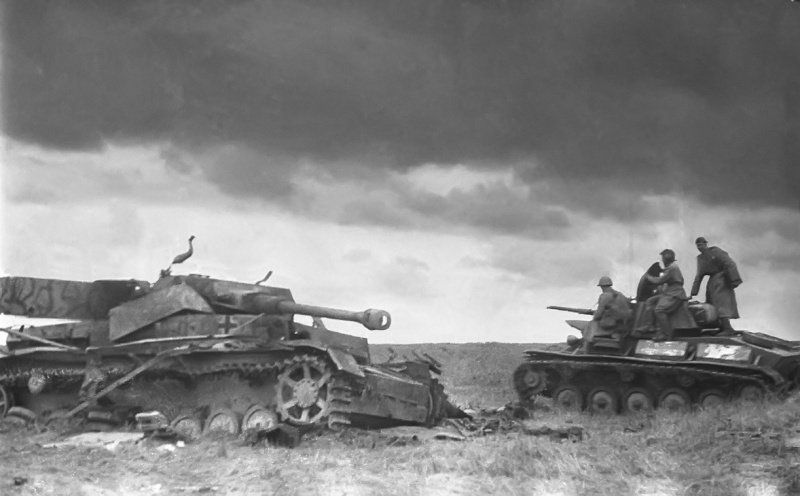 The knocked out Panthers blocked the road while the T-70 retreated. Pegov was promoted to a lieutenant and decorated as a Hero of the Soviet Union. 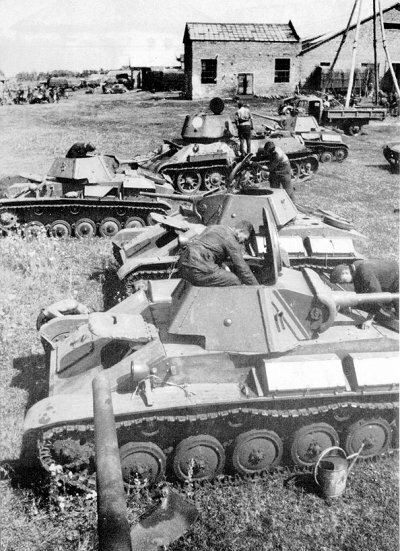 Also, on 6th July 1943, a T-70 commanded by Lieutenant B.V. Pavlovich of the 49th Guards tank brigade, destroyed 4 German Panzers (three unknown medium tanks and one Panther) near the Prokhorovka village, in the Kursk Oblast in Russia. 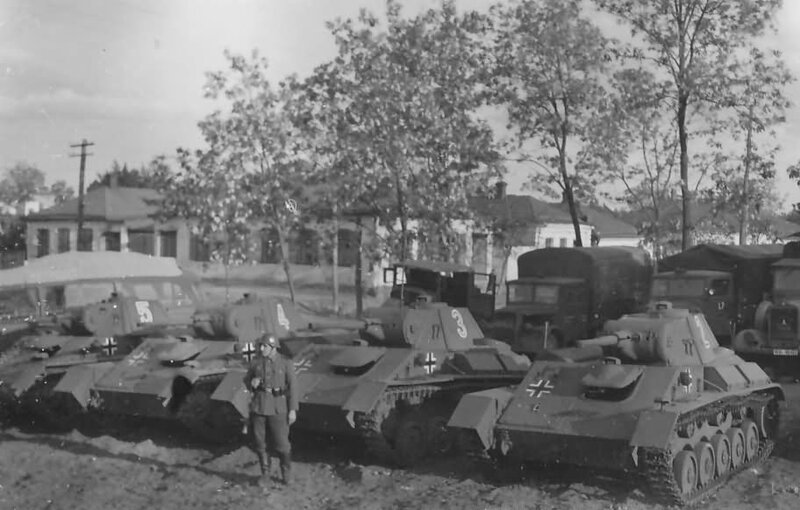 Soviet losses were inflated by the Germans, but it seems clear that many T-70s were lost. The T-70 met the same fate as the T-60, being sent to minor roles such as defending headquarters, convoy duties, reconnaissance, and training new crews. It remained in service as a trainer until 1948. A convoy of T-70s and a T-34/76 is prepared by the crews. Early camouflaged T-70, spring 1943. 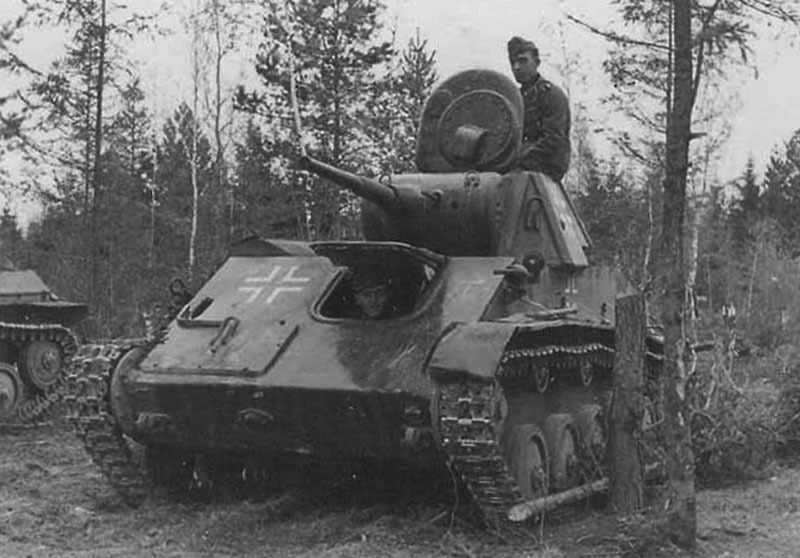 Turretless Beutepanzer T-70 (captured T-70) used as supply carrier. PzKpfw T-70 743(r) Summer 1943. Sand vermicels over dunkelgrau. A T-70 and some tankers at rest. Will you add the T-80? It’s already on the tubes, text done (waiting some revision and proofreading), and illustrations too. The real Waffentreagers will come in the future. The E100 Waffentreager will be in a future E100 article in a ‘Fictional Variants’ section. Question:. What were the penetration values on the ZiS-19BM? I notice there is nothing about her having radio equipment, after studying the armor development of the USSR for a pair of years (with a lot of it being on this website) I have the understanding the USSR was rather early to equip there tanks with radio, with it being standard equipment all the way back to the T-28, T-35 and atleast an option in the BT-5 at the trade of some ammo. 2nd question – would it be realistic to assume radio was always standard equipment on newly produced tanks by 1939/1940’s USSR standards? 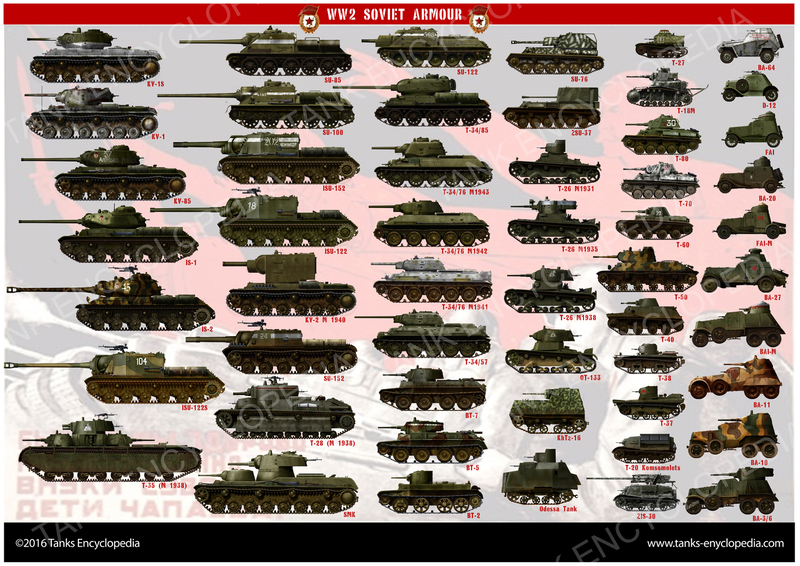 I am not including tanks like the upgunned T-18 or half-baked T-34s at Stalingrad. Radios on T-70s were rare. Only early tanks had them. Radios were actually rare in 40. They were producing too many tanks. 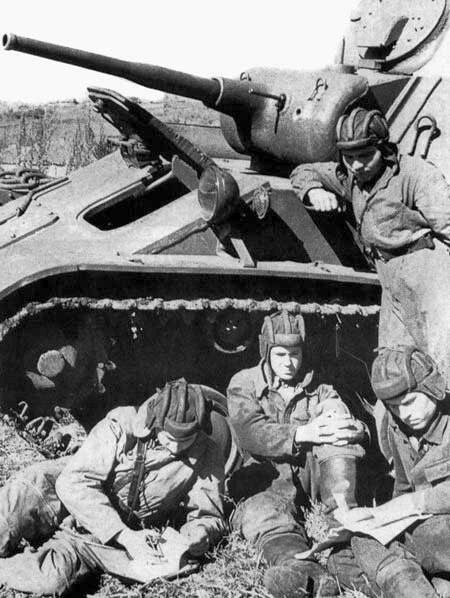 Only one in 5 T-34s in 1941 had a radio.